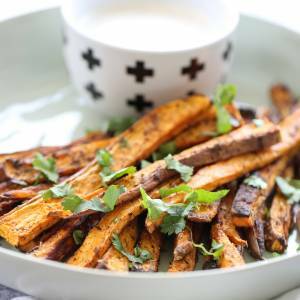 Slim cut roasted sweet potatoes with a healthy sauce for dipping! Mix all ingredients until combined. Chill until ready to use. *you want 1lb sweet potatoes after they are peeled, sliced, etc. If you weigh them at the store make sure you have a little more than a pound to allow for the peeling, and tossing of small pieces. Place sweet potatoes in a pile directly on baking sheet and drizzle with olive oil. Use hands to toss until all pieces are well coated. Sprinkle seasoning mixture on top and toss again with hands to coat. Arrange sweet potatoes in a single layer so that pieces are not touching each other. Place pan in oven and bake for 15 minutes. Use a metal spatula to gently flip fries and then return pan to oven. Cook for an additional 15-20 minutes or until fries are starting to lightly brown and crisp. Remove pan from oven and cool 5 minutes. While potatoes are cooking, mix all dip ingredients and place in fridge to chill. Serve fries immediately.